Today the Raspberry Pi Organisation has launched the new Raspberry Pi Compute Module 3, or CM3 for short. Since the launch of the original super compact Compute Module there have been two further iterations of the Raspberry Pi, so it's good for the CM to at last catch up. 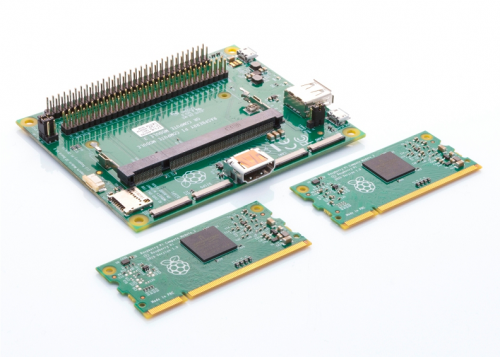 According to the Raspberry Pi blog the new CM3 is kitted out with twice the RAM and provides roughly 10x the CPU performance of the original Module. The new CM3 was designed for the same brief as the original; to provide makers with "an easy and cost-effective route to producing customised products based on the Pi hardware and software platform." Compute Modules are designed to fit in a standard DDR2 SO-DIMM socket which is easy to source and inexpensive. The newest CM3 is just 1mm taller than the old one - see below. 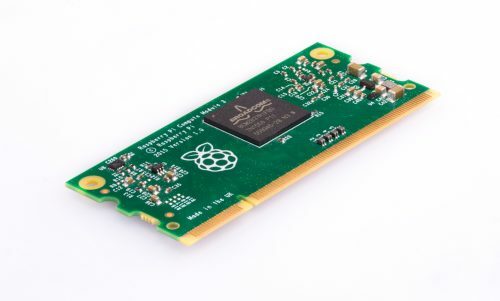 CM3: A 'standard' pared down RasPi 3 with 1GB of RAM, ARM Cortex-A53 quad-core BCM2837 processor at up to 1.2GHz, and 4GB of on module eMMC flash, and identical pin-out as CM1. CM3 Lite: As above but without on-board storage. Instead users can integrate their own choice of eMMC or SD card socket. Another update today comes in the form of the Compute Module IO Board V3 (CMIO3) providing breakout board functionality with HDMI, USB, flash memory programming interface, and more. The new CMIO3 (pictured below) is compatible with CM1 too. On the topic of the CM1 - it won't be obsolete but price reduced and likely still suitable for less demanding, lower power projects. The full lineup of Compute Modules and pricing is now as follows; CM1 is reduced to $25, and the CM3 costs $30 (£26.99), with the CM3 Lite at $25 (£21.99). You can get them from the likes of element14, or RS Components on their own, or in development kits.